Let’s say that an aerospace engineering startup is trying to design a UAV (unmanned aerial vehicle) for aerial surveying and imaging applications. The first step in designing such a UAV would be to create a concept whitepaper that lays out the design goals, potential design concepts, and how each concept will meet the goals. At this stage in the project, ideas are not usually constrained in terms of scope. Therefore, creative license can be taken to explore a wide range of possible designs. The purpose of this UAV design is to provide a robust aerial surveillance solution for agricultural applications. The UAV will be capable of capturing high-definition video footage and images of up to 500 acres of farmland in a single charge. This will be accomplished by an on-board 4k video camera as well as a radiometric thermal camera. The UAV will be capable of both autonomous surveying via waypoints as well as manual flying. The next section of the paper lays out each initial design concept that is generated to meet the previously stated goals. This portion of the paper often relies on computer-aided design (CAD) models to show the features of each design variant. For our UAV application, let’s say that we create three different designs: a quadcopter (essentially a helicopter with four rotors), a hexacopter (UAV with six rotors), and a fixed-wing UAV (essentially an RC plane). After running a series of high-level mathematical analyses to determine the sizing of each UAV’s components, three CAD models are created to show the exterior features of each UAV design. 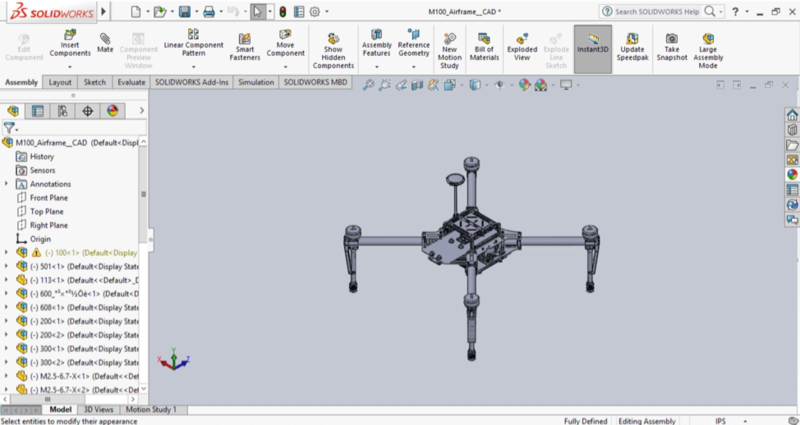 The image below shows a screenshot of a CAD rendering of the DJI Matrice 100 quadcopter airframe as an example of what such a model might look like. The actual model developed in this stage of the design process may have less detail than this model, but the overall exterior dimensions and basic features should be captured regardless. However, it is not sufficient to just show the CAD models. Features unique to each design concept should be highlighted in the model and explained in more detail. Also, the benefits of each design concept should be clearly laid out. For example, the fixed-wing UAV concept has the main benefit of only requiring one or two rotors versus four for the quadcopter design and six for the hexacopter design. Additionally, the wings help generate lift during flight, which can increase the UAV’s overall range. However, the quad and hexacopter concepts benefit from their ability to hover over specific areas of farmland and move to precise locations along the area being surveyed. In this fashion, the benefits of each concept should be summarized. Additional models or flowcharts may also be created to show how various mission phases are carried out (e.g. takeoff and landing mechanisms, camera deployment and operation, etc.) Concepts may also be compared to each other by using a WDM (weighted-decision matrix) or equivalent tool. A WDM is essentially a table that includes mission/design objectives and “weighs” each concept in terms of how critical it is to the overall design and mission. The decision matrix may also be unweighted if the conceptual designers want to rapidly determine which design is best without consideration about the specific importance of each design element. Other decision-making tools exist, such as morphological analyses.